(Lanka e News -2018.July.12, 8.00PM) The proposal made by president Maithripala to the cabinet Tuesday (10) was ratified by the cabinet.It is most noteworthy that this was approved unanimously without a single member opposing it. On the 7 th , 103 kilograms of heroin were seized at Kalubowila and Battaramulla. 30 parcels of heroin were first taken into custody from a jeep at Prathibimbarama Road, Kalubowila , and while the two suspects arrested in this connection were being questioned , a further cache of heroin (66 parcels) was taken into custody by the police narcotics bureau from a house at Subuthipura road , Battaramulla.The value of this 103 kilos of heroin is about Rs. 1250 million. Following investigations it has come to light the masterminds behind these dealings are now serving death sentence in the prison cells. Since there is no implementation of death sentence in Sri Lanka though those found guilty are sentenced to death by court , many of these criminals get released in 20 years or less . The necessity for the president to make this cabinet proposal was based on the grounds that if the death sentence delivered on these criminals are to continue un-implemented in the way it is now , the criminals while remaining in jail will continue carrying on the heroin business without let or hindrance. Notorious Duminda R. Silva alias kudu Dumiya and his closest assistant Chaminda Ravi Jayanath alias Dematagoda Chaminda who are in prison in connection with the murder of Bharatha Lakshman, though they are not incarcerated for heroin , are carrying on their heroin business even better than when they were outside , sources have revealed. Meanwhile Gotabaya Rajapakse at Bibile Medagama Vihara said today (10) , during the Mahinda Rajapakse era ,the drug menace was controlled but now it is apparent the drug scourge is growing and the government is unable to control it. 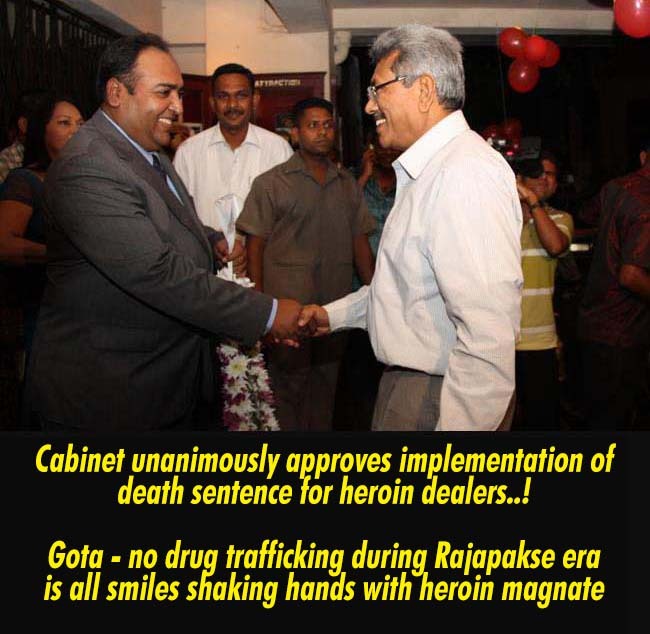 It is this same Gotabaya who is making these announcements, during the period when he was the defense secretary he directly and closely had dealings with drug traffickers . That fact is known to everyone except a just born infant . The photograph herein depicts Gotabaya ( can you beat that ! this is the Gotabaya who is aspiring to be the next president of SL !) most happily shaking hands with Mujehideen a most infamously famous drug dealer who supplies heroin to SL , and now hiding in Malaysia . Mujehideen the key man who smuggles heroin into Sri Lanka is a relative of Mohomed Samoon Mohomed Shyam who was taken into custody along with a quantity of heroin from a super luxury mansion at Ward place in 2003, and is now in the death row following death sentence passed on him.. Meanwhile the cabinet unanimously approved the implementation of the death sentence in SL . Interestingly and intriguingly , the kudu (heroin) channel of the brother of kudu Duminda which is being run for the purpose of laundering the illegal earnings of kudu Duminda had not shown any response by way of a news report ,to the latest cabinet resolution.